In the first of what I hope to be an ongoing, occasional feature, I’m turning today’s Top 5 over to someone else – in this case, the Irish singer-songwriter Karrie, whose 2016 album Perpetual Motion I reviewed a few weeks back. 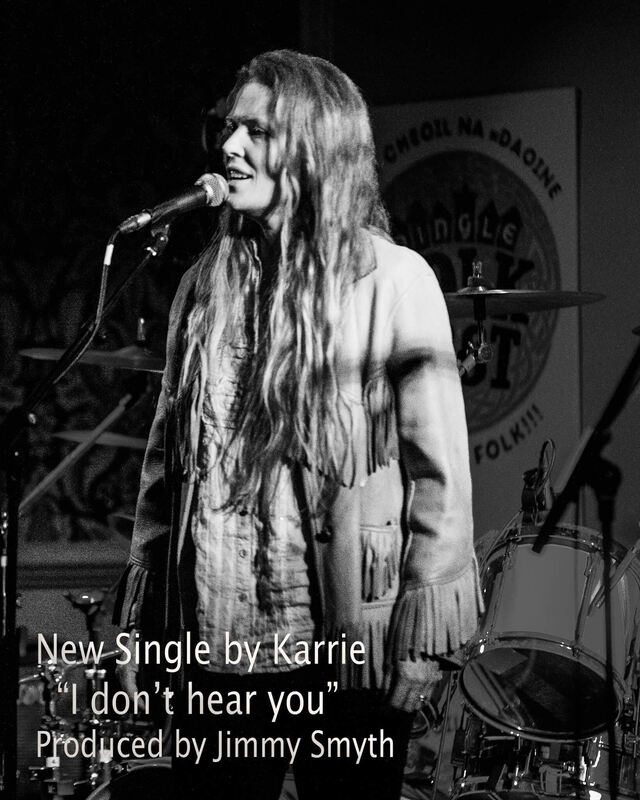 She released the single, “I Don’t Hear You,” a few weeks back, too. As detailed elsewhere, she got a late start in the music business, swapping horse training for singing after the economy tanked in 2009 -, though you wouldn’t know it from her music. (More on that here.) Job change aside, she still maintains her farm – and took time out of making hay (literally) to field my questions. Did you sing around the home prior to transitioning to music? You have such a wonderful voice, I can’t imagine that you didn’t share it with, at the least, family and friends – and horses, for that matter. I come from a family of nine children. (I’m last in the line, the youngest.) Everyone can sing. When it’s not an unusual thing, it’s a given. We always sing at family get togethers. Having a big family puts you in line. My older sisters and brothers pretty much chose what music the younger ones heard. Joni Mitchell’s song “Carey” is on her 1971 album Blue; I was nicknamed after it. I won’t ask your age, but it sounds like you were in your mid-30s when you shifted to music. I was born in ’75 . 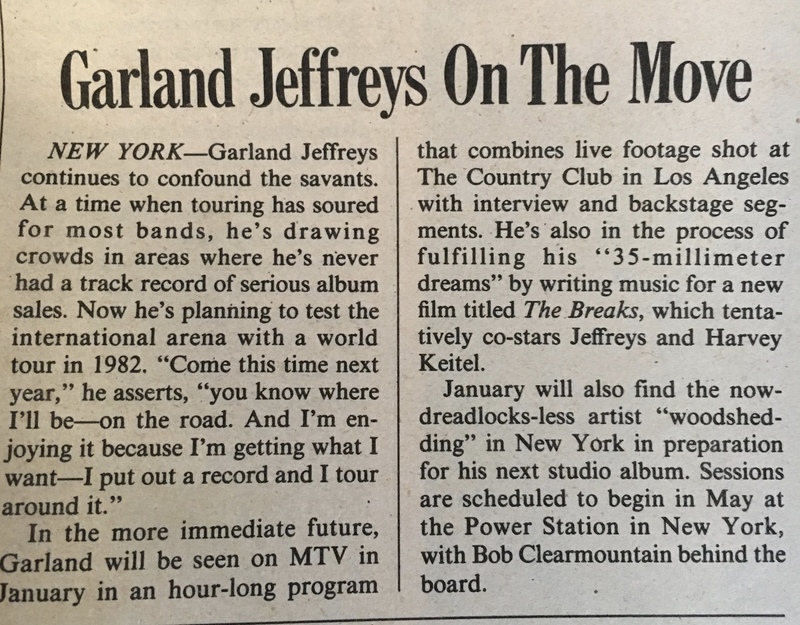 That in mind, my influences were well embedded in my head by the time I wrote my very first song at 34, “Stay Away.” (It’s on my first album, Jelly Legged). That first open-mic night – about how many people were in the audience? What song did you sing? I don’t really like to recall my first gig . I think it was an ill chosen venue in Cork city. An open-mic night for rock music . Think I bombed! About “I Don’t Hear You” – it’s such a wondrous piece. What inspired it? “I Don’t Hear You” is a song I wasn’t very careful about writing. Its content must be a delayed reaction to continuous pressures. Kinda like getting numb to something. I hear what I imagine are several influences in it. The opening bass (as short as it is) reminds me of the opening to “Wichita Lineman,” for example, and the horns conjure the Style Council (my wife hears it, too, but we’re also Paul Weller fans; or she’s just saying so to humor me). Both add to my delight with the song. Were those nods intentional? Happy accidents? I really love hearing about what people get from my music . This is funny because “Wichita Lineman” is right up there in my most favorite songs. An interesting note on this might be that I don’t write the instrumental music for my songs bar having some ideas here and there. I mostly write a cappella, probably 99% of the time. I do make sure my song is complete when I give it over to “wardrobe.” It’s a selfish thing I guess. Jimmy Smyth produced here. I don’t tell him how to play guitar. 1) Joni Mitchell – “Carey.” My memory of it is I was very small My sisters would pick me up in their arms and dance with me singing along to Joni. Joni Mitchell influences me now in almost everything I write. 2) John Martyn & Danny Thompson – “Sweet Little Mystery” from Live In Dublin. John Martyn lived in Ireland. He was alive here and I didn’t I know how important his music would be to me. I was still training horses when I heard him first on the radio and thought this guy is out on his own. It very nearly made me turn from horses years before I did. I wish I had sought him out. I think It would have made a very big difference to my then poor decision making. It still bothers me that I ignored my own self wanting to go hear him live. Such a regret. 3) Elvis Costello – “Brilliant Mistake.” This song is like a movie. It’s perfect in every way. This issue, the third in the magazine’s history, marks the start of my half-decade-long subscription to Record. You’ll notice, on the cover, that the date is listed as “Jan. 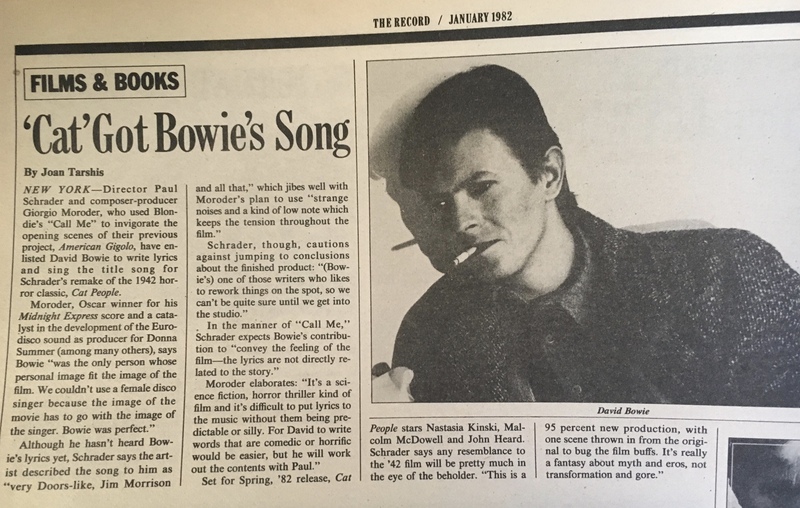 1981.” That’s incorrect, as becomes evident once one unfolds it to its newspaper-size front page, where the date is listed as “Jan. 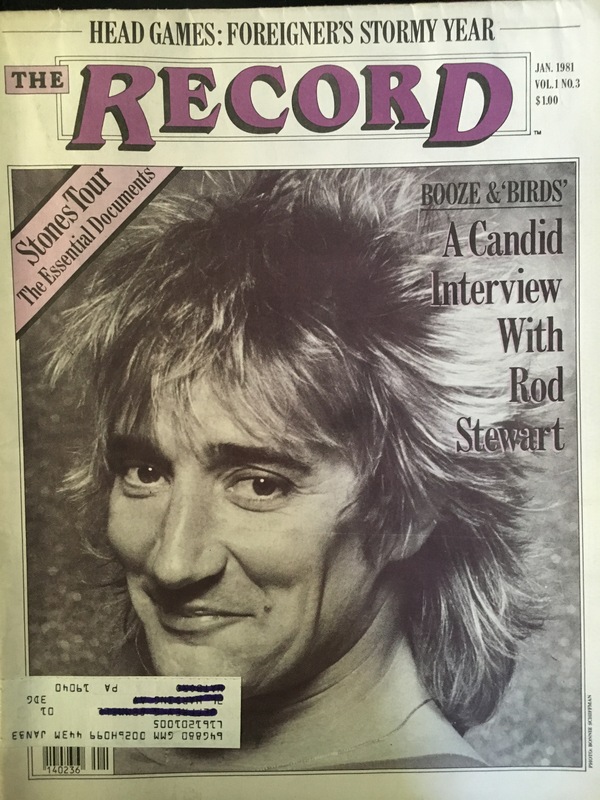 1982.” It wasn’t the only flub the magazine made during its run. 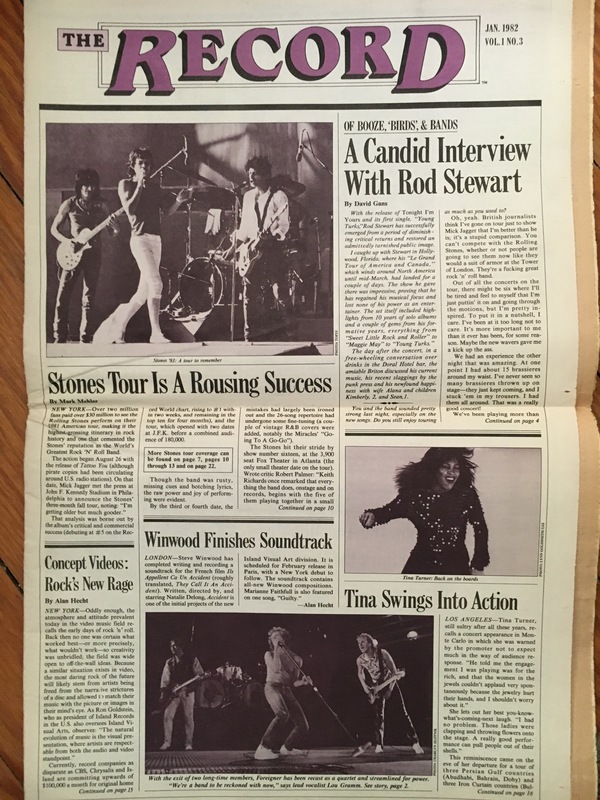 One issue, and I’ll likely feature it in the coming weeks, lists Joan Jett on the cover, but includes nada thing about the former Runaway inside. There’s also a piece about the new wave in music videos: concept videos. 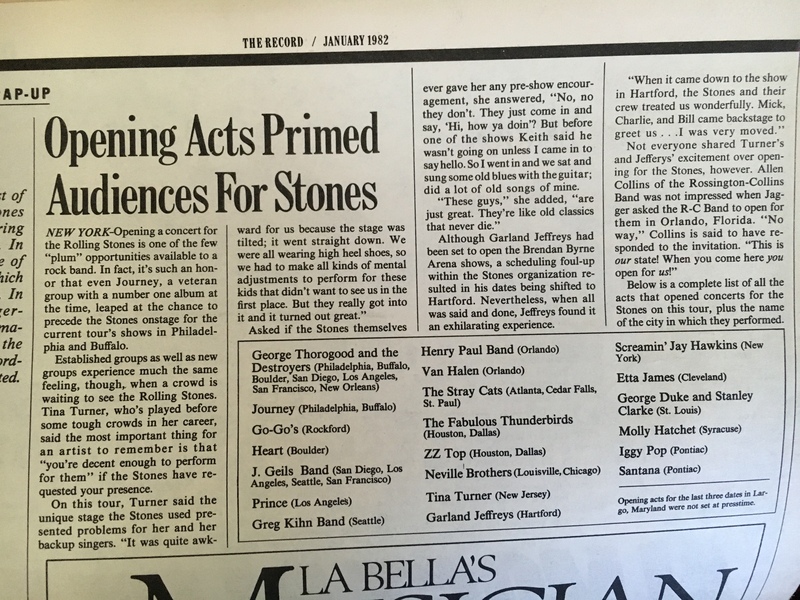 Other articles focus on Foreigner, Molly Hatchet and the Rolling Stones, who’d just wrapped a major tour. So, though I rarely indulge in twin spins, the double mention deserves a double-shot. As with the first clip, here’s Garland on the ABC late-night sketch-comedy show Fridays. 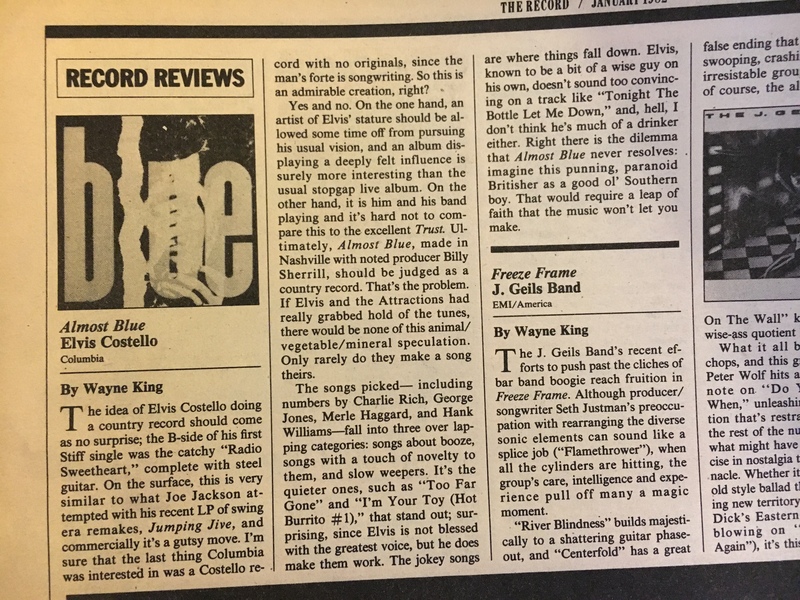 I’ve written before about this song, and shared this same video, but – hey, unlike Mr. King, I find the album extremely listenable and likable. Maybe not Elvis’ best, but definitely worth a spin.